Medical polymers are utilized for a variety of human contact and non-contact applications in the medical industry. These materials are chiefly used in the manufacture of medical implants, devices, disposables (gloves, vials, tools), and packaging. Medical polymers are biocompatible in nature and either remain inert or are easily processed by the human body. Allied Market Research expects medical polymers market to garner US$19,014 mln by 2022, registering a CAGR of 13% during the forecast period 2016-2022. The growth in investment towards research and development, increase in adoption of medical polymers and development of low cost materials are driving demand for medical polymers in the healthcare industry. Medical polymers are adopted widely across the healthcare industry with significant efforts to commercialize new medical polymers to meet the specification of high end applications. Demand for polymers in healthcare markets is growing significantly owing to a significant upsurge in the demand for medical implants, whereas demand for implants is growing primarily due to increased incidences of chronic diseases and increasing global geriatric population. Demand is witnessing significant growth in all the regions, due to rapid acceptance and adoption of polymers from product designing to final product manufacturing. Although several polymers are biocompatible, not all are approved for commercial use. The key players in the global medical polymers market have adopted various business strategies, such as research and development, product launch, agreement, acquisition, collaboration, expansion, and partnership, to sustain the intense market competition. Large amounts of investments are ongoing to develop implants and devices using various polymers driven by their versatility and stability. This is further expected to increase the adoption of polymers for medical applications and enhance the attractiveness of the medical polymers market for industry participants. Resins such as PEEK and PE, especially ultrahigh molecular weight polyethylene (UHMWPE), possess the maximum market potential in the medical polymer segments. These polymers are gaining popularity owing to their structural strength, bio-inertness, commercial viability, and bio-compatibility. PEEK and UHMWPE find increased usage in medical implants, including orthopaedic and electronic implantable devices. PP, PC, and other resins, including ABS, PMMA, and PET, also show increased utilization in manufacturing medical devices. These engineering thermoplastics exhibit excellent stability, durability, and formability and are preferred over metals and polymer for designing medical devices and implants. PVC is another key segment used for manufacturing medical devices and disposables. PS is used in human-contact applications owing to its non-toxicity and stability. Acrylates are used to produce hydrogels, which are applicable in wound-care, drug delivery, and tissue engineering. Elastomers are mostly used in sealing, packaging, and disposables such as gloves. Biodegradable plastics including PLA, PGA, and PLGA are being developed for use in disposables and packaging applications as substitutes for PE and PP. Although medical polymers have been used in the industry since a long time, their adoption has gained momentum over the last decade. This sudden rise is attributed to the increase in research to develop alternatives to traditional materials including metal and polymer for use in medical applications. Development of engineering plastics, such as PMMA, PEEK, ABS, and PET, accelerated the growth of the medical polymers market. These plastics conform with the safety requirements for use in medical implants and devices. Furthermore, medical polymers are available at lower costs compared to metals and polymer. Engineering plastics used as medical polymers can match the structural strength, stability, inertness, durability, and formability of metals and polymer, while being lighter and more resource efficient. Moreover, the supply of medical polymers is more consistent when compared to metals and polymer, which directly depend upon the mining scenario. Medical polymers are widely used across various applications, as they are easy to manufacture and facilitate customizations. Moreover, they provide ease of fabrication, flexibility, and biocompatibility, and remarkable mechanical, electrical, chemical, and thermal properties of materials that are used as composites for medical implants. Increasing number of medical procedures, such as joint reconstruction & heart surgeries and rise in cosmetic and plastic surgeries in the developing countries are the few other key drivers of the market. Resins dominate the medical ceramics market due to a significant replacement trend of conventional medical devices materials with advanced polymers such as polyphenylene ether and few others, which provide high-quality medical devices. Further the application segment is led by devices holding nearly half of the global polymers market. This is mainly due to advancement in the technology provided by the polymers manufacturers such as polymer laminate technology and so on. Devices captured a major share in the global medical polymers market followed by disposables such as gloves, syringes and others. The bioresorbable plastics (PGA) of polymer market is expected to grow at a highest CAGR of 17.1% during the forecast period. Resins hold the highest share of four-fifths of the total medical polymers market in 2015. In the application segment, devices hold nearly half of the market share in 2015, where Diagnostics equipment contributes majorly towards the revenue of the segment. Disposables is the fastest growing application segment and is expected to grow at an estimated CAGR of 14.2% during the forecast period of 2016-2022. U.S. was the largest market in terms of demand for medical polymer in 2015. The market for medical ceramics witnesses intense competition among the major players in the market. This competitive rivalry results into product innovation and development. Although the market is largely fragmented dominance of the major companies is characterized by their vast product portfolio for medical polymers, high investment in R&D, and strong distribution network. The companies have adopted various strategies such as agreement, product launch, product approval, merger & acquisition, collaboration, and investment to sustain the highly competitive environment of the medical polymers market. As per GMI Insights, the global Medical Polymers Market will exceed US$24 bln by 2024 gaining by CAGR close to 9%. Global medical polymers market will be positively affected by the continuously growing pharmaceutical device demand. Pervasiveness of cardiovascular issues, general medical conditions, infections, and other diseases, coupled with increasing development of medical treatments and procedures and increasing general awareness will propel the pharmaceutical device industry in the coming years. Global pharmaceutical device industry generated more than US$300 billion in 2015 and will flourish at a decent CAGR of over 6% up to 2024. USA accounted for close to 45% share of the total pharmaceutical device business in 2015 with more than 6,500 pharmaceutical device manufacturing companies. Increasing applications of polymers such as polyether ether ketone (PEEK), polyphenylsulfone, polysulfone, and polyetherimide in pharmaceutical devices will enhance the global medical polymers market throughout the forecast period. Increasing elderly population and increasing medical need among them will also steer the medical polymers market in the forecast timespan. Global population over 65 years increased by almost 80 million from 2010 to 2015 and at present it stands at more than 8% of the global population. Chronic diseases including diabetes, hypertension, heart disease, arthritis, osteoporosis, and dementia are prevalent among the geriatric generation and they require continuous medical attention. According to the American Geriatrics Society, about 30% of the 65-plus patient population in the U.S. needs geriatrician care and this number will increase as close to a fifth of the U.S. population will be over 65 years by 2030. This will have a positive influence on the global medical polymers market in the forecast period. Growing home based health care demand will also enhance the global medical polymers market in the coming years. Increasing life expectancy and elderly population will drive this growth, along with rapidly spreading chronic diseases, technological advancements, affordable home health care systems with alternative treatment methods, and government initiatives associated with the cause. Global home health care industry recorded over USD 200 billion revenue in 2015 and it will witness a substantial rise at more than 8% CAGR up to 2024. Volatility in the petrochemical based raw materials price due to depleting petroleum reserves and fluctuating crude oil prices may pose a restraint on the global medical polymers market. The product is manufactured using superior quality polymerization techniques and is solely dependent on the raw material availability. They are blends of different grades to provide biocompatibility, which is the most vital characteristic. Strict regulations imposed by various medical agencies, WHO, FDA, REACH, etc. regarding the product quality and prices may also hinder the medical polymers market growth in the coming years. Medical polymer market products include medical fibers & resins, medical elastomers, and biodegradable medical plastics. Fibers and resins include polyvinyl chloride (PVC), polypropylene (PP), polyethylene (PE), polystyrene (PS) and other thermoplastics. This segment generated over US$8 billion for the global medical polymers market in 2015 and will grow at over 8% CAGR, on the account of advanced technologies to fine tune implant capabilities and improve the biocompatibility, along with rising awareness about health and hygiene in the developing regions. Rising environmental concerns about medical disposables will have a noteworthy influence on the global biodegradable medical plastics in the forecast time span. This product segment will likely grow at more than 15% CAGR in the overall medical polymers market up to 2024 owing to the development of various bio-based plastics. Medical elastomers segment has been further classified into styrene block copolymer, rubber latex, and other thermoplastic elastomers. Medical polymers market has also been segmented on the basis of uses into devices and equipment, packaging, and other specific applications such as in tissue culture, cardiovascular diseases, etc. Devices and equipment application accounted for over half of the global medical polymers market size in 2015 and will witness more than 8% CAGR up to 2024. Easy cleaning methods and negligible chemical corrosion of medical polymers will steer the product demand throughout the forecast span. Development of bio based and engineered biodegradable polymers for packaging of medical products as well as medical disposables will flourish the packaging application of the global medical polymers market. Medical packaging will also rise substantially owing to the mandatory disposal norms. This segment will witness a CAGR more than 9% in the forecast span. North America, driven by the U.S., will have a significant share of the global medical polymers market owing to its mature medical and pharmaceutical industry. Growing medical expenditure in the region and high awareness regarding health and fitness will boost the demand in the next few years. North America registered more than US$4.5 bln in 2015 and will grow at a notable rate throughout the forecast period. Europe medical polymers market will witness a slow growth at less than 7% CAGR up to 2024 and will lose its share to Asia Pacific, Latin America, and Middle East & Africa, which will witness a high growth in the coming years. Rapidly increasing healthcare initiatives in countries such as China, India, Bangladesh, Indonesia, and Pakistan will encourage growth in Asia Pacific. Increasing population coupled with unavailability of proper pharmaceutical facilities in the region will boost the growth at over 10% CAGR in the forecast period. Global medical polymers market is fragmented with presence of several large and medium level companies. Key market participants include Bayer AG, Evonik Industries, Celanese, DuPont, Dow Chemical, Eastman Chemical, and Huntsman. Bayer and DuPont provide application specific customizations to augment their market share. The companies rely on various strategies including high R&D investments, merger & acquisitions, collaborations, and significant integrations in the value chain. Volatile raw material prices have restricted the entry of new market players. However, the existing manufacturing companies provide intense competition by regularly upgrading their product portfolio and expanding their customer reach. Growing demand in the emerging countries has shifted the focus of major manufacturers towards Asia Pacific and Latin America. Medical polymers market size is solely dependent on the growing pharmaceutical industry. Growing awareness and increasing government initiatives towards health and fitness characterize the industry trend. Increasing economies and global reputation of the countries in Asia Pacific, Middle East Asia, Africa, and Latin America will likely boost the products in the coming years. Increasing application of as substitutes for traditional metals, ceramics, and glasses for medical devices and implants will propel the global medical polymers industry. Introduction of new and innovative biopolymers will also likely enhance the industry growth in the next few years. Technavio’s market research analyst predict the global medical polymers market to grow at a CAGR of more than 8% between 2017 and 2021. Polymers have extensive usage in the medical industry, including implants, diagnostic systems, and accessories. Medical polymers are lighter in weight as compared with other counterparts such as metals and are preferred for lightweight applications. Medical polymers are primarily used to manufacture intraocular lenses, vascular grafts, contact lenses, breast implants, facial implants, prosthetic heart valves, catheters, dental implants, and vascular skin implants. One of the latest developments in the market is the rising demand for smart polymers in medical applications. Smart polymers act as therapeutic agents, tissue engineering scaffolds, cell culture supports, and bio-separation devices. The use of biodegradable polymers is also gaining momentum specifically in ophthalmic, cardiovascular, and drug delivery systems. In terms of geography, the Americas is anticipated to grow at a fast pace during the forecast period and will maintain its dominance in the global market. With the surge in government initiatives to improve the public healthcare systems, vendors in the market are expected to focus more on developing innovative products, such as temperature- and pH-sensitive polymers. The global medical polymer market is estimated to grow at a steady pace during the forecast period. The medical polymers have wide consumption across different biomedical applications, and the future applications of medical polymers are under intensive R&D. Key players dominate the market in terms of geographical reach and product innovations. Competition in the market will intensify in the coming years due to the entry of several chemical giants. To sustain themselves in the market and gain a competitive edge over their peers, the vendors need to focus on the formulation of application-specific finished medical polymer products. The fibers and resins segment accounted for the largest market share during 2016 and will continue to lead the market over the forecast period. Polyamides, PC, polyesters, and PE are some of the prominent medical fibers and resins. Nonbiodegradable medical fibers and resins are rigid plastics, including thermosets and thermoplastics. These polymers are thermally moldable and are preferred in the medical industry for their favorable properties such as lightweight. The global medical implant market is likely to witness steady growth in the coming years due to the high demand for implants such as dental, knee, and hip. Polymers are replacing other materials such as alloys, metals, and ceramics for use as biomaterials. Polymer materials are more versatile and are used for applications such as facial prostheses, tracheal tubes, heart components, dentures, kidney and liver parts, and hip and knee joints. Medical polymers are lighter in weight as compared with other counterparts such as metals and thus, are preferred for lightweight applications. In addition, biodegradable polymers also eliminate the need for repeated surgery in case of implants for removing the implanted device. The global medical polymers market is anticipated to grow at CAGR of 8.15% during the forecast period. As per Grand View Research, the global medical polymers market size was valued at US$ 9.69 bln in 2013, growing at a CAGR of 8.4% from 2014 to 2020. The global market is expected to witness growth owing to rising demand for lightweight polymer-based devices from health care industry. Approximately 16% of world population is expected to be above 65 years of age by 2050. Growing geriatric population, especially in the developed countries, is also expected to support the growth of the industry. Polymers based medical equipment are being increasingly preferred compared to conventional materials owing to advantages such as light weight, processing ease, low cost and easy availability. Emerging economies of Asia Pacific such as India, Singapore and Malaysia are high potential markets because of the rise in medical tourism in these countries. Over the past few years, the home healthcare industry has witnessed significant growth on account of various benefits including low cost in comparison with hospital care and intensive care. Growing need to maintain healthy lifestyle coupled with new preventive care measures has led to the utilization of devices which has contributed to the market growth. Growing demand for advanced and sophisticated healthcare devices is expected to support the industry growth, and this trend is projected to continue over the forecast period. Medical resins and fibers were leading product segment and generated revenues worth US$7.04 bln in 2013. Growing demand for low cost, high strength and durable materials for various applications including packaging is expected to drive growth. PVC segment is expected to grow at a CAGR of 8.8% in terms of revenue from 2014 to 2020. This is primarily because of rising demand for the polymers for manufacturing devices on account of increasing awareness regarding its various benefits including portability, light weight, high strength, low cost and high wear resistant. Medical-grade PP, PE, PS, SBC, rubber latex, TPO, and TPU are extensively used in a host of healthcare-related application. These products are expected to witness high demand due to their extensive use in manufacturing tubing, and pharmaceutical packaging. Biodegradable plastics are a niche segment, and this product segment is set to grow tremendously over the forecast period owing to favorable regulations supported by the presence of a stringent regulatory framework for synthetic non-biodegradable polymers. This is expected to fuel growth, and the segment is expected to grow at a CAGR of 15.8% from 2014 to 2020. In terms of application, medical device and equipment dominated the global market accounting for over 47% of the volume share in 2013. Growing demand for advanced and sophisticated equipment coupled with favorable government initiatives for promoting consumption of medical grade polymers is expected to impact positively industry growth. Packaging accounted for a significant revenue share on account of increasing awareness regarding hygiene. Furthermore, strict measures being undertaken by regulatory agencies to curb tampering and counterfeit of drugs and equipment. The segment is expected to grow at a CAGR of 7.8% from 2014 to 2020. North America market was valued at USD 4.18 billion in 2013. Growing ageing population and expanding home healthcare market in the U.S. and Canada is expected to drive growth. Asia Pacific accounted for over 24% of the overall volume share in 2013. Government initiatives for promoting the use of medical graded polymers are expected to drive growth over the forecast period. 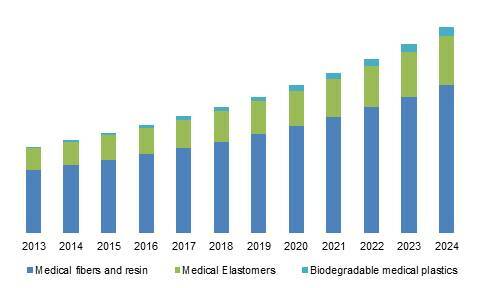 Increasing awareness regarding better healthcare facilities and growing demand for low-cost treatment has led to significant growth for these polymers, and the trend is expected to play a major role in driving demand over the next five years. Oil price fluctuation coupled with capacity expansion and contraction has contributed to price volatility in the market and may act as a key barrier for new players entering the industry. This industry is characterized by forward integration from the manufacturing stage to distribution and end-use industries. In April 2011, Dow Chemical Company announced plans for introducing a new product range of ELITE enhanced polyethylene resins. These resins offer high puncture resistance and stiffness.